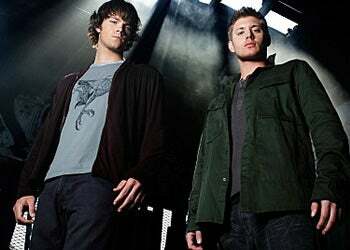 Supernatural Officially Renewed, But Where's Smallville? Both The Vampire Diaries and Supernatural will be back next fall. The CW officially announced early pick-ups for a second year of their Twilight Lite and sixth year for the Winchester brothers amongst other shows today, but what about Smallville? Praising Supernatural's "heroic work in a perennially tough time period," and giving a special shout-out for "one of the most loyal audiences of any show on television" in a statement released today, the network renewed the show, alongside Vampire Diaries, America's Next Top Model and Gossip Girl. Supernatural creator Eric Kripke has often spoken about his "five year plan" for the show, but recently seemed more open to continuing for another year, although there's been no announcement about his involvement as yet. Supernatural's renewal was rumored earlier alongside a pick-up for another year of Smallville, but there was no mention of the Superman show in the CW's statement. Supernatural And Smallville Renewed — But Is There Any Place Left For Them To Go?